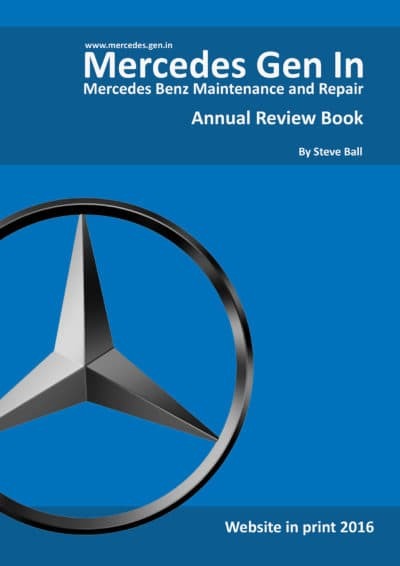 You may have already read of the problems here, including banging and knocking noises associated with faulty rear dampers (Gas strut/tube type) on the Mercedes C200 (W203). 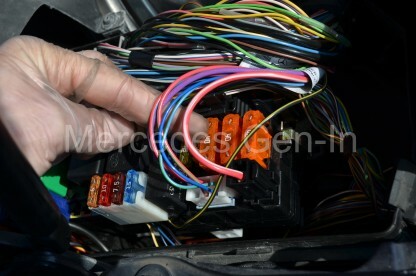 In this post we will detail how to easily change the faulty parts and get the vehicle back to specification. 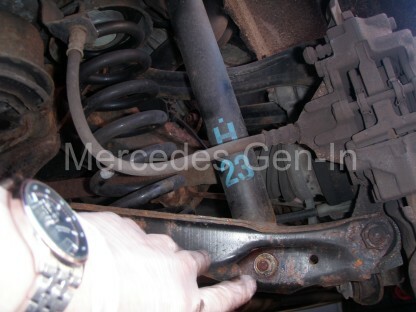 While neither of the dampers removed had any visible signs of fluid leakage and had recently passed annual inspection, they were exhibiting knocking noises on slow speed movement over uneven ground. 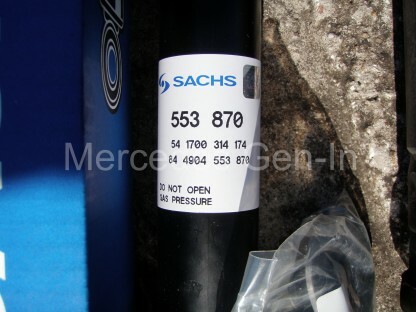 Internally a gas type damper has a charge of oil and a further charge of high pressure gas, usually nitrogen. 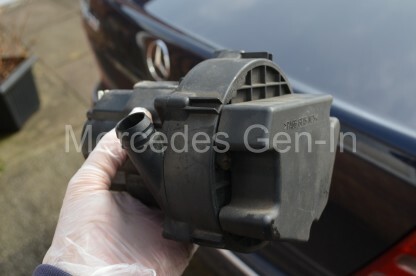 As they age the gas escapes through the damper rod seals and leaves just the oil to perform all of the damping. 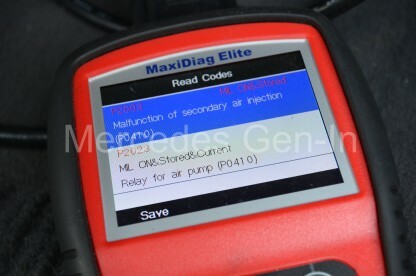 When new, the purpose of the gas charge is to control small and light movements of the suspension, leaving the oil to take care of damping the larger travel and more violent bumps and bangs the car car is subjected to in normal road use. 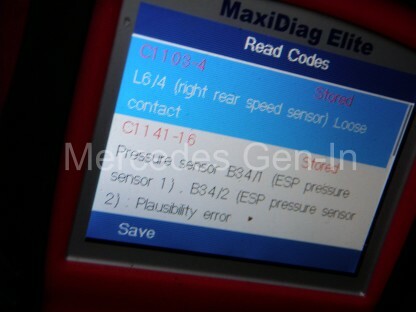 Calibrated internal valving controls the dampers rate and makes for a perfect combination of gas filled over hydraulic fluid dampers for vehicle use. 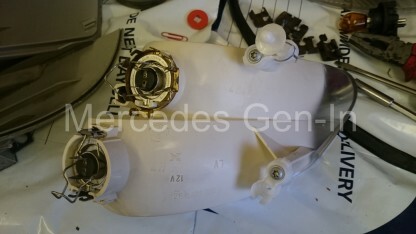 However once the nitrogen charge has escaped over age, the damper will have difficulty controlling the smaller reflex movements of the suspension. 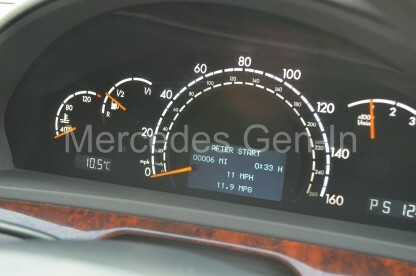 larger travel may still be adequately catered for with just the remaining oil, but slow speed damping will, in most cases be poor. 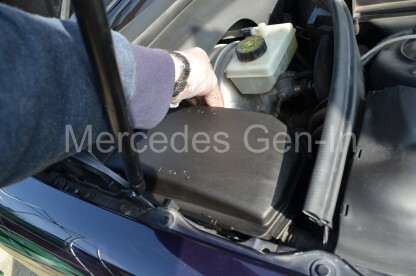 Due to the resulting little to no light damping due to the depletion of the gas charge, the oil is having to do all the work. Working harder and forcing oil through the metering valves more rapidly to try and compensate, heats up the oil which often froths as it passes back and forth through the internal orifices. Once air is introduced into the damper oil as frothing, it becomes ineffective as the air is compressible – any subsequent damping will be hampered by this condition. 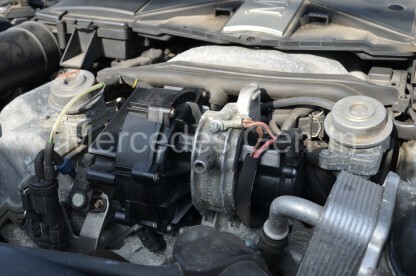 Over time, as the shock absorber ages, the first leakage is often the gas charge. 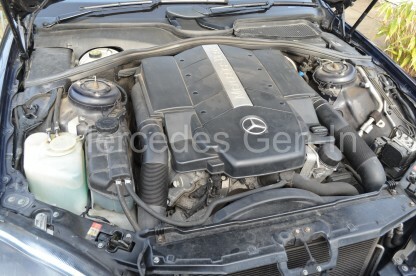 It is this natural ageing that requires some diagnosis and the faulty dampers replaced accordingly. 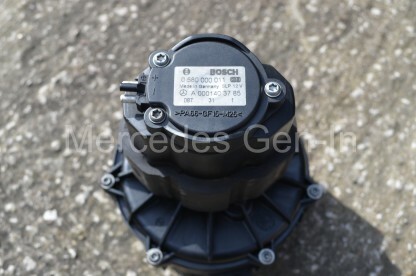 Replacement is very simple on the Mercedes C200 model series and both dampers can be easily replaced in about one and a half hours. 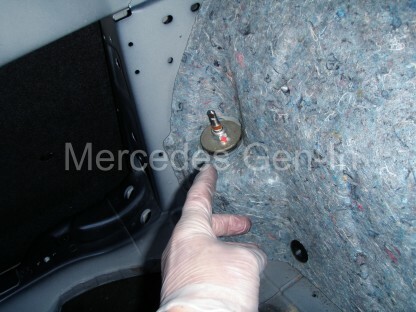 First empty the boot load area, remove the carpet liners from both sides and base of the compartment. 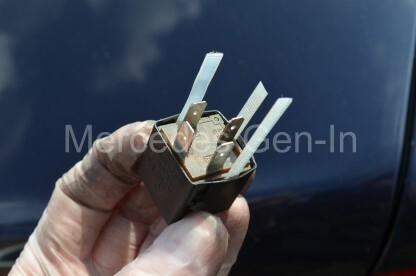 There are two plastic mushroom clips at the top edge either side, once these are removed the carpet can be folded back to gain access to the strut tops once the hard plastic cross panel has been lifted. To do this simply pull the two D shaped mushroom clips and disengage the panels forward edge from the plastic spare wheel well retainer lip. 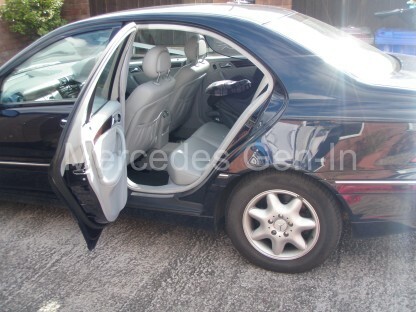 This black hard plastic cover can now be lifted clear of the car. 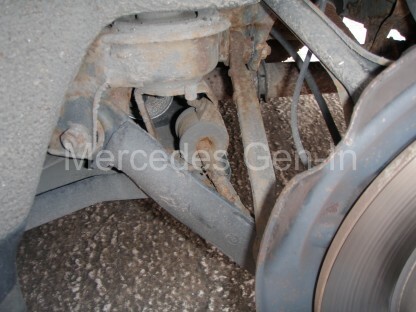 Working one side at a time, undo the road wheel lug nuts and support the vehicle on a trolley jack. Remove the wheel and spray penetrant onto the two 10mm head, self tapping screws that hold the plastic wishbone cover in position. 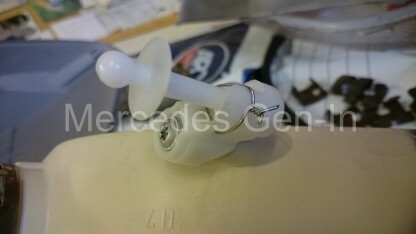 Unscrew these two fixings and remove the plastic wishbone cover. 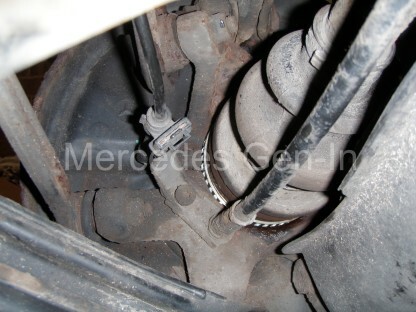 Now spray the 16mm lower suspension nut with a similar penetrating oil. If the dampers are original fitment they will have an inverted torx head damper bolt head and a 16mm nut on the other end, your replacement will probably have a standard 16mm nut and bolt included in the kit. 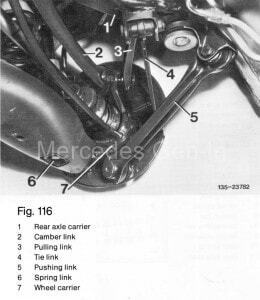 Place a support under the wishbone and lower the jack so the wishbone ‘just’ contacts the block and takes some of the tension from the suspension component. 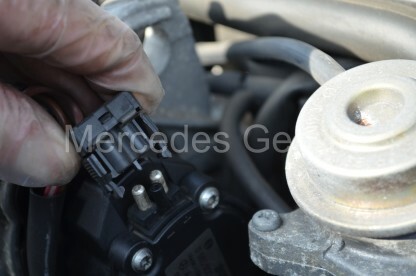 Undo the lower damper nut and tap the bolt through. 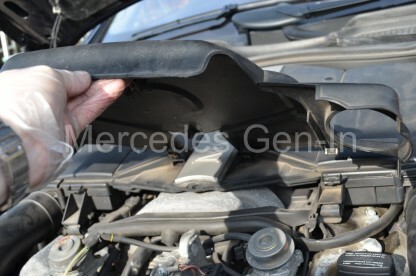 From inside the car use a 17mm spanner and undo the top fixing, you may need to hold the damper rod with grips to prevent it spinning as you fully remove the nut. Now take off the top plate washer and then lever out the ‘rubber donut’ from the protruding thread and sleeve. 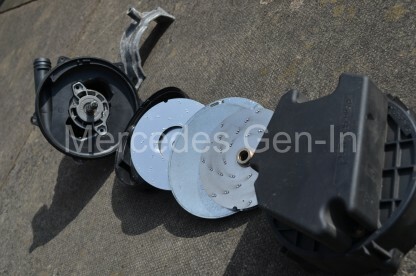 Discard these parts as you should have new components supplied in the kit with the new damper. From under the wheel arch, use a stout screwdriver or short lever to force down the top of the damper so that it clears the mounting hole, once free, let it extend fully in a controlled manner. Tilt the top of the damper out into the wheel arch area and lift it free, pulling it out of the lower wishbone as you go. 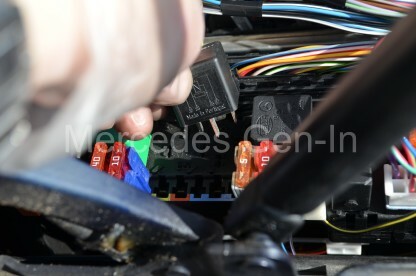 Refitting the new dampers is an exact reversal of removal, be sure to fully tighten the top securing nut and use the supplied lock nut to prevent it undoing. Again you may need to use grips on the rod end to prevent it turning whilst you are tightening. 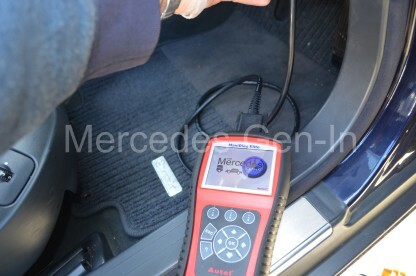 Conduct a road test and enjoy quiet safe motoring! If you are interested have a look at the short 30 sec. video below, this shows how the first six inches or more of the old dampers stroke is virtually ineffective, though the lower section still has some damping capability. 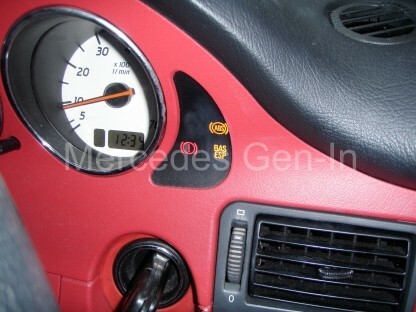 This is due to either gas escape or faulty/damaged/aged internal valving. 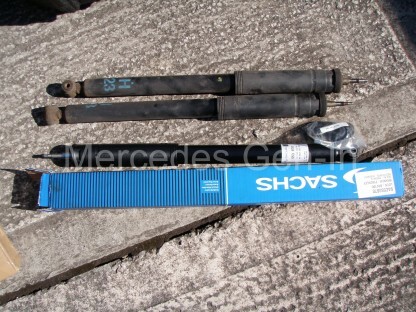 New shock absorbers/dampers transformed the vehicle over rough roads and totally eliminated the rear end knock at slow speed. 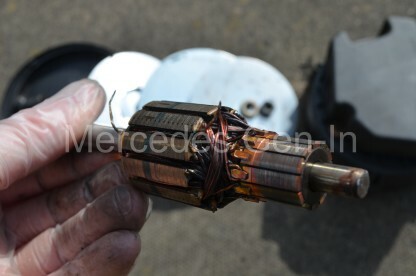 If you hear a thudding or knocking noise from the rear of your vehicle you will want to find out what is the cause pretty quickly as the constant noise will soon drive you mad! 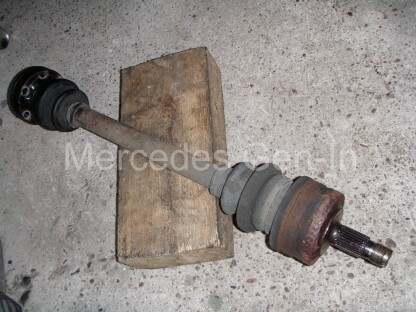 On the Mercedes C200 and actually most Mercedes Benz passenger car models, that all share the long lived 5 link rear suspension set up, there can be several causes. 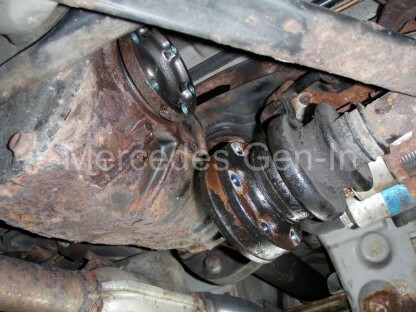 The first potential cause to eliminate is wear to the anti-roll bar bushes or sway-bar (US). There is two bushes mounted to the chassis in D saddles that carry the roll bar from one side to the other, any any play here can cause thudding or knocking on uneven ground. Usually rust staining gives away the poor condition of these busses – what happens is the bar corrodes inside them and presents a rough oxidised surface that eventually wears away the supporting rubber at it moves under normal use. 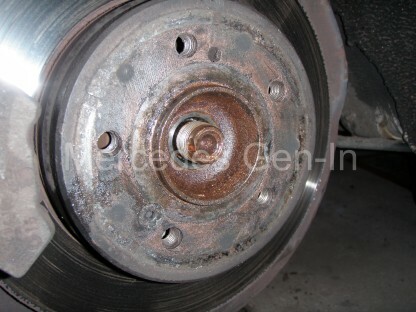 This is why it is good practice to file down, de-rust and repaint any exposed metal before fitting new bushes. 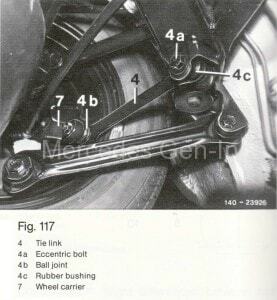 On each end of the roll bar there are drop links (like a dog bone in shape) these have a rubber bush at both ends and connect the roll bar to the suspension hub carrier. 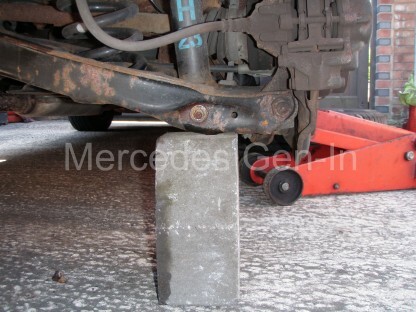 It is important to check the condition of these rubbers also. 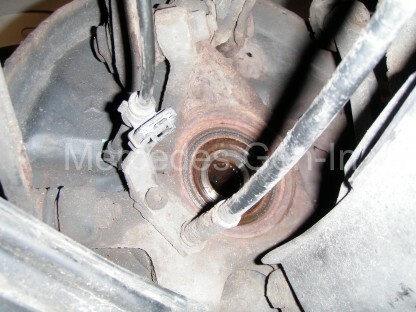 In both of the above cases it is important to inspect all bushes while the vehicle is on all four wheels and in its normal driving position, as lifting one wheel will put the connected bar in tension and you will be unable to see the small amounts of play that would be more than capable of causing knocking noises. If all looks sound and no play is present, turn your attention to the rubber bushings at each end of all the suspension links, use a pry or lever to check them for play. 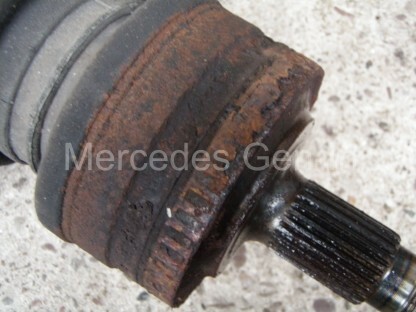 These bushes do deteriorate and although sometimes looking in poor condition, cracked on the ends with rusty sleeves, they are still serviceable as long as they do not allow lateral movement where the arm could contact its mounting. 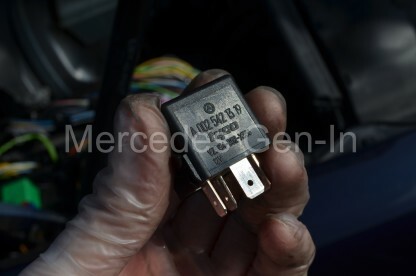 Play of this kind would be severe and easily noticeable under power or braking. The noise you will have most difficulty in finding the source of will be the one that comes and goes at slow speed on uneven terrain, it will be irregular and probably most prevalent while crossing speed bumps or rail lines on a crossing. 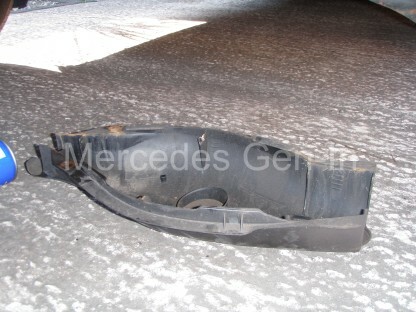 If you have checked out all the suspension components, exhaust mountings and interior of the boot area you will be turning your attention to a faulty damper. 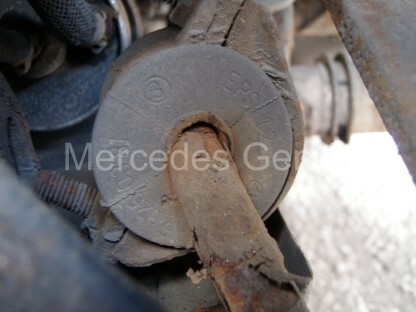 As these deteriorate over time they will in most cases eventually cause a knocking as the valving begins to break up internally or in severe cases the internal oil is lost through leaking. 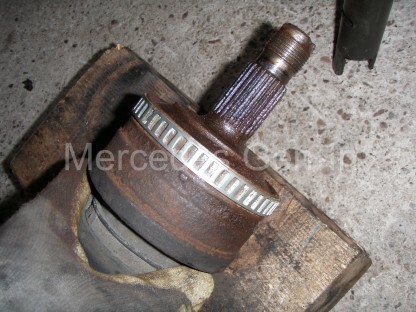 The simplest way to check for a faulty damper is shown in the following short video. 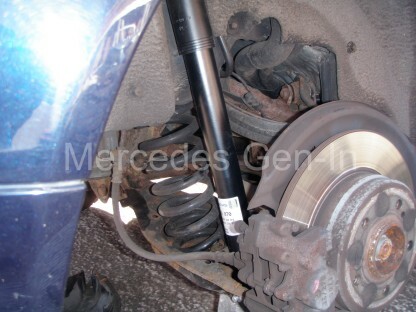 Quite often it is possible for a car to pass an MOT test with a faulty or ageing shock absorber, especially if it is secure in its mounting and not in any way leaking. 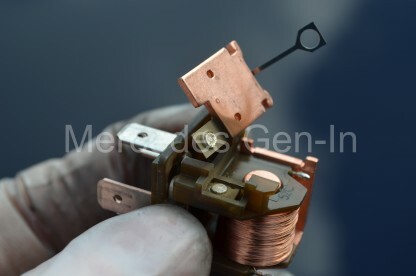 It is only as the units age that they gets weaker in operation and eventually often fail, providing little in the way of suspension damping at all.